I am proud of combining my education and applied work. 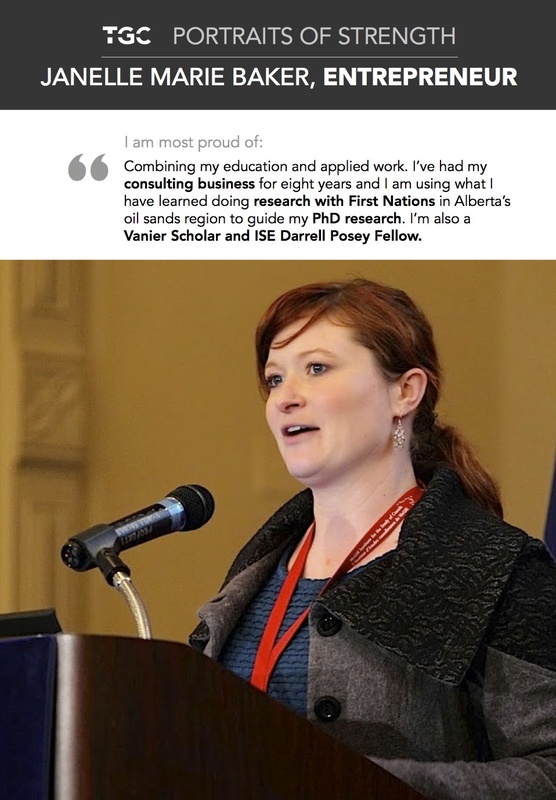 I’ve had my consulting business for eight years and I am using what I have learned doing research with First Nations in Alberta’s oil sands region to guide my PhD research. I’m also a Vanier Scholar and ISE Darrell Posey Fellow. The biggest obstacle I have faced is growing up in a rural area. My mom is the only person in my family with a high school education and I was discouraged from going to university. My advice to women is to trust your instincts and do what feels right. If I’d listened to all of the people telling me what I shouldn’t do, I would have never achieved anything. The irony is that most of the naysayers in my life are people who are now unhappy in their jobs. Twitter | LinkedIn | Academia.edu | www.